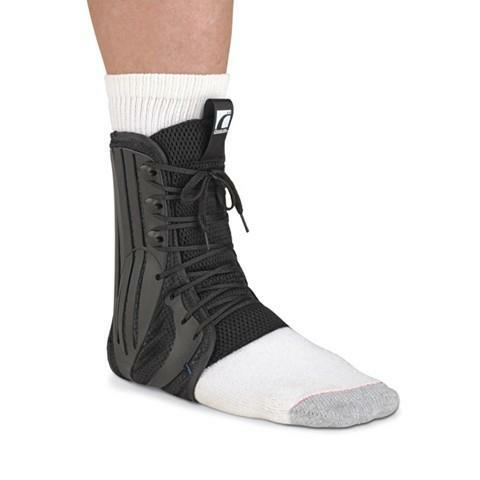 The Form Fit Ankle Brace with Exoform technology is a hybrid between a rigid ankle stirrup and a soft ankle support. With a stirrup-shaped, plastic exoskeleton that conforms to the user's anatomy, it offers the comfort and compression of a soft ankle support with 20-35% more support than traditional stirrup supports. Optional figure-8 heel lock strapping performs consistently, unlike taping that stretches over time. Speed-laced design provides the option of a quick lace-up. Aerospacer base material for comfort and breathability. Embedded stirrup structure provides excellent inversion/eversion support. Finger pull loops on heel and tongue for easier application.